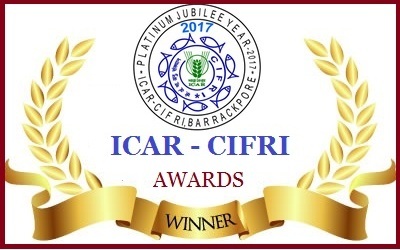 ICAR-Central Inland Fisheries Research Institute (ICAR-CIFRI) is a premier research institute having distinction of generating relevant database on various facets of ecology and fisheries of inland waters. Realizing the threat that climate change poses on the inland open water fisheries and biodiversity including change in base flow, altered hydrology, thermal stress to aquatic flora and fauna, extended range and increased occurrence of flood, habitat degradation, alteration in breeding and spawning behavior etc. the institute organized a one-day workshop on 15.03.2019. The present workshop addressed four major thematic areas viz., Inland open water fisheries management, Impact of climate change on inland open fisheries, Vulnerability assessment of wetland fisheries in the context of climate change and climate resilient adaptation strategies/techniques for inland fisheries. Ten eminent speakers were invited for speech and experience sharing in the workshop. The inaugural session of the workshop was graced by Dr. A. G. Ponniah, Former Director, ICAR-CIBA, Chennai & Chief Guest; Dr. B. K. Das, Director, ICAR-CIFRI, Barrackpore; Dr. M. Prabhakar, PI, NICRA, ICAR-CRIDA, Hyderabad; Dr. (Prof.) B. B. Jana, Rtd. Professor in Zoology and Vice Chairman, ICES, University of Kalyani, Dr. M. K. Das, Former Head, Fishery Resources and Environment Management Division, ICAR-CIFRI, Barrackpore; Dr. U. K. Sarkar, PI, NICRA, ICAR-CIFRI & Head, RWF Division; Dr.Sanjib Bandyopadhyay, IMD, Alipore, Kolkata; Dr. V. R. Suresh, Head, REF, ICAR-CIFRI; Dr. B.P. Mohanty, Head, FREM Division; Dr.Abhijit Mitra, Former Head, Dept. of Marine Science, University of Calcutta, Dr. S. Adhikari, ICAR-CIFA, Kolkata, Dr. (Prof.) S. K. Das, Dept. of Aquaculture, WBUAFS; Prof. Lalu Das, B.C.K.V. ; Dr. U.K. Mandal, ICAR- CSSRI, RC, Canning and all the scientists of the Institute. At the outset, Dr. B.K. Das, Director, ICAR-CIFRI welcomed all the distinguished guests highlighting their brief work and achievement in the area of fisheries and aquaculture, and participants of the workshop. Dr. U. K. Sarkar explained the objective of the workshop for the benefit of the participants. He urged the participants to actively engage in deliberations during the workshop and come out with fruitful recommendations and identify emerging areas of research in the next plan. 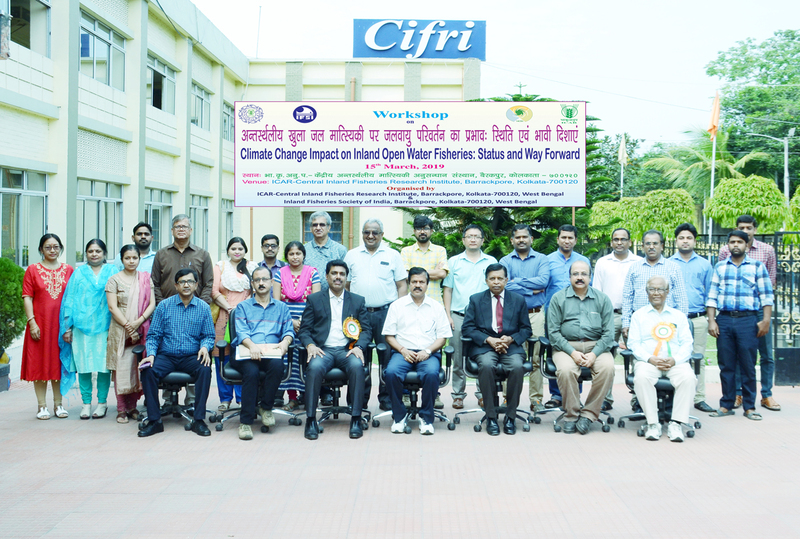 Dr. A. G. Ponniah expressed that ICAR-CIFRI has made significant strides in the area of climate change. He complimented the Director Dr. B. K. Das and Dr. U. K. Sarkar for such achievements of the Institute. He was happy to be involved in ranching of wild major carp seeds today in the river Hooghly at Barrackpore. He mentioned the case of Penaeus vannamei introduction in India, the science of breeding/culture of the species was translated successfully into a usable policy recommendation, which changed the shrimp culture scenario in India. He reiterated that in addition to good science and publications, public money should lead to public goods useful for the common people and farmers. Dr. M. Prabhakar complimented the team CIFRI for the significant achievements under inland fisheries and also for organizing this workshop. He also mentioned that CIFRI’s work under climate change is one of the best among all the partner Institutes. Dr. B. B. Jana informed the participants that a significant portion of global biodiversity is under threat of extinction. The programme was followed by two technical sessions and one session for poster presentation. The inaugural session was compared by Ms Sukanya Som, Scientist, ICAR-CIFRI and ended with the vote of thanks presented by Dr. S. K. Nag, Principal Scientist, ICAR-CIFRI. The workshop was convened by Dr. B. K. Das, Director, ICAR-CIFRI and coordinated by Dr. U. K. Sarkar, Principal Investigator, NICRA and Dr. S.K. Nag, Principal Scientist, ICAR-CIFRI. The programme is expected to throw light on the future research potentials in the area of climate change adaptation and mitigation strategies in inland open waters fishery and biodiversity.